This is not the full history of the bicycles, or the riders, or the cycling trails and infrastructure – it’s simply some local stories about men and women cycling in the East End and the Beach, who, from the 1880’s to the 1920’s, became infatuated with the sport and made a go of it in our area. Cycling in the East End really took off in the late 1800’s. There were no gas-guzzling vehicles, just horse and buggies, trains and bicycles. The roads in those days were terrible. Some were made of corduroy, others of wood planking, others of mud and dirt. In our area, we had the town of East Toronto, with its main road, Kingston Road, which was for many years unpaved. This was a problem for the men and women determined to become cyclists and get in on the new fad. The main roads were too muddy – what were they to do? Organize, of course. The bicycle enthusiasts formed bicycle clubs with names like “The Excelsiors”, “The Queens”, “The Scots”, “The Torontonians”, etc. which all fell under the umbrella of one or two organizations, one called “The Wheelmen of Canada”. These clubs had their own special clothing they would wear whenever they were on their bikes. Races would start at Kingston Road near Main Street. There might be a hundred of them, and racers would travel to Trenton, Ontario and race back along the treacherous and bumpy roads. Nowadays, roads have bicycle paths strictly for the cyclists. In the old days, they had to fend for themselves. That’s until the wheelmen and wheelwomen of East Toronto decided they would have their own bicycle trail. The Excelsior Club started a fund to fix up a special section of the road on Kingston Road and vicinity just for cyclists. They collected their own money by public subscription and built The Cinderpath, a section of the road using levelled sand and cinders to make it compact, tamped down with other materials. This, dear cyclists, became one of the first bicycle trails in the area. The cyclists expanded this idea to go from Main Street to the Danforth and other major streets in the area. But the trouble was other parts of the area didn’t want anything to do with The Cinderpath because of the cost and maintenance. Sound familiar? Clubs would build special tracks for racing. One was on the site of the old Newmarket Race Track, located a few hundred feet north of Main and Danforth. On the west side, a few quarter mile tracks were built for racing. Nowadays, buses will carry bicycles on the front. Then, the riders petitioned the railroads to allow them to carry their bikes. In the old days, the postmaster general Rodolphe Lemieux gave the approval for a bicycle brigade, painted red, so the postmen could ride bikes to catch the trains while they bring the mail to the different stations. Forty postmen cyclists started at once – what a wheel of good fortune for the cyclists. Cycling was centre stage at the Scarboro Beach Amusement Park, which was used from 1901-1925 for many sporting events like rugby, football, and lacrosse. They also had a velodrome, a special course for bicycle races. Velodrome races were the premier event for many cyclists, like William “Torchy” Peden, one of the fastest cyclists at the time. In the velodrome, thousands of fans would come to cheer on their favourite clubs and cyclists competing against one another. 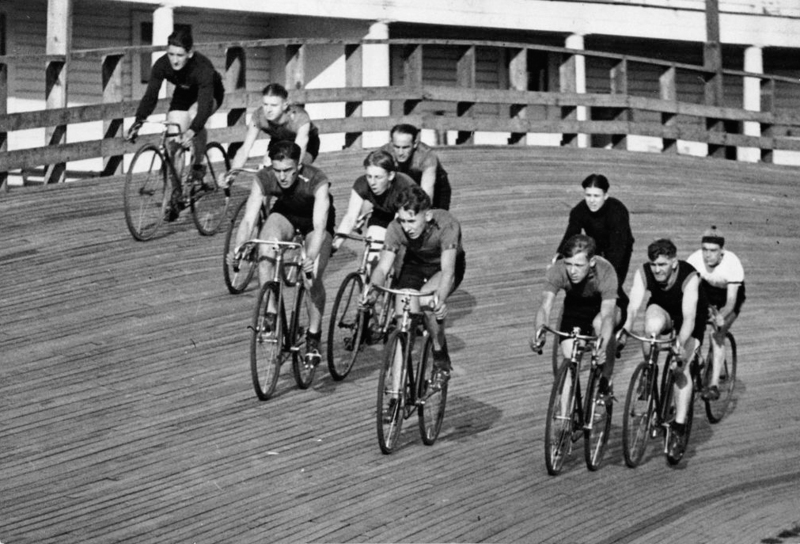 This was the heyday for cyclists in the Beach area – sadly, all things must come to an end, and soon enough, the cars took over. The velodrome was razed to the ground. Nowadays, we have the modern bicycle paths painted all over our fair city, the cyclists fighting with the automobile drivers, horns honking, tempers flaring. That’s progress! On the bright side, we still have beautiful bike trails going through southern Ontario and Toronto. All of these trails had a beginning, and we can be proud in the East End that we had one of the first beginnings, with The Cinderpath. And always remember: Big wheels have people who spoke up for them. Gene Domagala is a local historian and the ‘unofficial mayor of the Beach’.